A feast of flavors and sweet nectars, this selection offers harvest fresh morsels from every corner of the grove. Equally opulent is its dramatic presentation, making it irresistible to lavish on someone special. 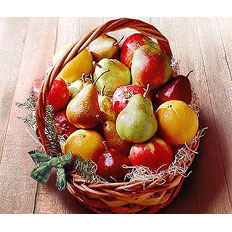 Contains 5-6 Pears, 3 Apples, 3 Oranges and 2 Best-of-the-Harvest seasonal fruit selections, in an attractive gift basket with your personal message.